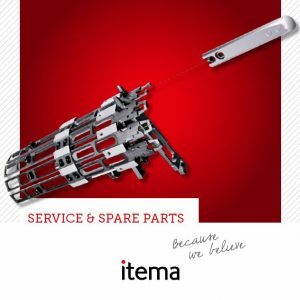 Itema provides top-quality spare parts, upgrade and conversion kits, and spare parts assistance for your weaving machinery, and ensures a fast and reliable delivery service in more than 130 countries. You can quickly and easily order spare parts either directly through our e-commerce platform, myItema, or by contacting your trusted Itema sales representative and/or local distribution agents. Our OEM online shop, myItema, is an intuitive web-based ordering system that provides a simple, easy-to-use tool for our customers to browse through our online parts catalog, create a shopping list of parts required, and order parts online directly. This system also provides the option to receive quotes prior to ordering and the ability to track the order progress and status online. Furthermore, for large organizations, up to 5 user accounts are available, of which only one authorized to proceed to purchase. In this way, your weaving mill personnel and/or purchasing colleagues can prepare an order or a so-called wishlist, request an offer or prepare the shopping basket, and only one designated person who is authorized to purchase is able to place the order. Last but not least, in myItema you can search for a specific part based on the part code, or with a few short clicks add from catalogue, add from an Excel file or add from a wishlist. You can also browse through our online catalogues and manuals easily accessible based on the weft insertion technology (rapier, airjet or projectile). If you would like to request a myItema account, please write to: sparepartsservice@itemagroup.com today. To ensure the high performance over time or to add / improve functionality to satisfy new market needs, it is possible to retrofit your existing weaving machines with specific upgrade & conversion kits aimed at bringing all the latest Itema innovations to you. Whether you are looking to optimize machine performance, improve user-friendliness and ergonomics, reduce operating costs, or start the production of different fabrics, you can find your upgrade kit directly online in the myItema portal (registration required). ORDER YOUR SPARE PARTS AND UPGRADE KITS ONLINE NOW!